In July, Profiles in Science, the National Library of Medicine Web site celebrating leaders in biomedical research and public health, added an extensive selection of the papers of Adrian Kantrowitz, MD (1918-2008). 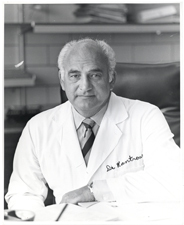 Kantrowitz was known for performing the world’s second human heart transplant, and as a medical inventor who helped to revolutionize cardiac care by developing implantable cardiac pacemakers, mechanical left heart devices, and the intraaortic balloon pump. Kantrowitz published more than 200 articles and obtained more than 20 patents during his career. Profiles in Science features much of his correspondence as well as published articles, and photographs including photos of the first human heart transplant done in the United States, Kantrowitz’s correspondence with other physicians about implanting the early pacemaker models, and correspondence with electrical engineers who helped fabricate prototypes of his pacemakers and other cardiac assist devices. “Adrian Kantrowitz was a gifted innovator who repeatedly expanded the boundaries of both cardiac surgery and medical technology. His inventions, especially those providing counterpulsation to the heart, have saved thousands of lives,” said Donald A.B. Lindberg, MD, director of the National Library of Medicine. With the addition of the Kantrowitz papers to the Profiles in Science collection, the number of prominent researchers, public health officials, and promoters of medical research whose personal and professional records are presented in Profiles in Science has grown to 29. July 1, 2009 in People, Products.